Preface: This is the third selection form the musical line of Angel City brews. Thanks to the folks at Angel City for send me this sample of their special brew. And, for the record, I do not read the promotional materials sent with beers or the information from any of the sites listed in these tasting notes before I taste any brew. Appearance: Actually crystal clear, this deep dark garnet red brew is topped with a thin head of large bubbles that fall quickly into a thin layer of small creamy bubbles. The Belgian lace is thin. Aroma: The first aromatic sensation is of rich burnt malted barley. The second impression brings some coffee/ espresso notes to the front. The final exploration brings the coffee notes to the forefront. Mouth feel: This is a mouth filling brew. The flavors are far ahead of any carbonation influences. Flavor: First impressions, following the initial refreshing sensation of cool brew, is a strong coffee/barley flavor speared by a spike of sharp metallic tang. The second sip reveals a touch of dry astringency that softens the metallic tang. The third dip into the pint brings a bitter, non-metallic cover to the coffee and astringent touches of the dry flavor from what I believe to be patent malt. Finish: There is a real rush for the door by the major parts of the flavor profile of this brew. Then there are a few traces of vegetal green flowers and sweet barley. In the end the finish takes enough time to pass so that the rest of the brew isn’t chugged. Comments: First of all, what is a “stritch” stout? Next, is it my imagination or are stouts getting less dense? First comes the “see through” Guinness product… then Guinness 250(Guinness Porter) and now Angle City with this “yes you can see light through the glass” brew. This is not necessarily a bad thing… I’m just wondering if I am the only one noticing this. I would do this brew a world of good to become acquainted with some low-and-slow truly buried-in-the-pit smoked pig… yes a whole pig. Which means a few cases of Rahsaan Roland Kirk … or even better… a keg… and a sandy beach… and a sea breeze… and crystal clear aqua water as warm as a…. but I digress. Follow up: The Angle is now an Angel… and I grasp a “stritch” sax…. what is a “stritch” stout? Next PostA Taste of Brew Free or Die I.P.A. It's Angel City, not Angel City, ya goob. That is, Angel City, not ANGLE City. My bad. Good beer though. Did he mention it was 10% alcohol?? And to answer your question, a "stritch" is an alto sax without the upturned bell – one of Kirk's modified instruments. He did this so he could play several instruments at once. RIP RRK. The angle is now an Angel… stritch sax… yes. 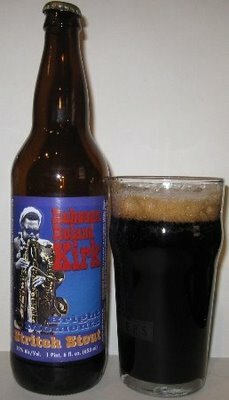 stritch stout? ?